We discussed our agenda for the May 18 work detail. We will be fixing up the range & adding more to the backstop, painting picnic tables, working on the large generator, hooking up the gas lights in the clubhouse & working on the food plots. A committee has been set up to research & come up with a plan for the food plots this year as we had problems with weeds last year. Any members who might have knowledge to share or want to help, please reach out to Cindy Garver. The Easter Egg Hunt is scheduled for Saturday, April 19 from 2-5pm. All children are welcome – members’ children, grandchildren, friends, neighbors etc. There will be plenty of prizes, candy & eggs for all of the kids. If you have any donations or would like to help, please contact Bonnie Bender. We discussed the upcoming Pig Roast. We will be finding out prices on live pigs (about 180 lbs live weight) to butcher. We will also be getting a new round of t-shirts & possibly sweatshirts. Tickets are available. Two are included with membership & additional adult guests are $15 a ticket. 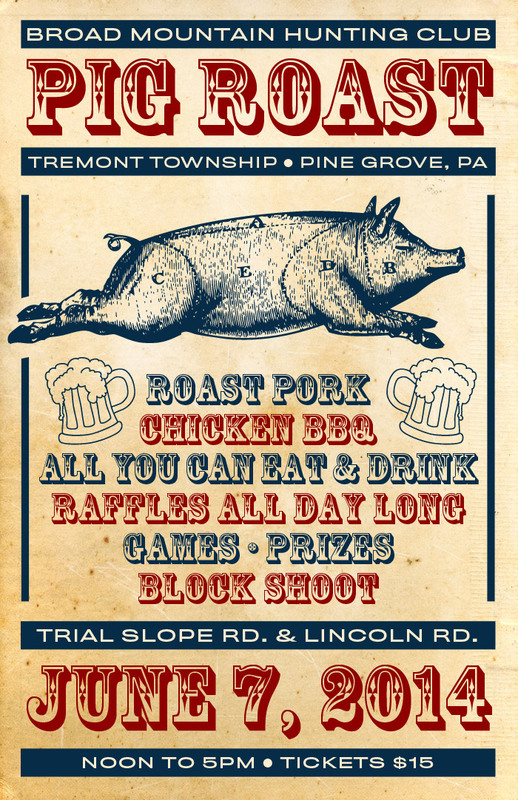 There will be all you can eat & drink, games, prizes, raffles, a block shoot & more. The Jeep club is planning on holding a large “mud” type marathon event in September. We will plan on selling concessions & are looking into other ways to make some money for the club while there’s a large crowd available. If you have any suggestions, please make sure to bring them up at a meeting. The monthly gun was won by Cody P.
The 50/50 was won by Scott B. Please note, there WILL be a regular club meeting on Wednesday, June 4th. There was some confusion about that since the Pig Roast is on June 7th.